Who is Peter Taradash AKA “Grandpa”? Let me first tell you about few important factors you should know about Grandpa. He’s NOT widely known by any standards. Quite contrary; he is as private as one might get. Nobody knows his real name. Nobody knows where he sleeps. Grandpa is most likely the “only guy left” who knows enough to say it like it is. He knows the Offshore Concept and all the Offshore Strategies there is to know. Perpetual Traveler life one can only dream of! It’s safe to say when it comes to any Offshore Concept like Protecting Your Privacy, Minimize Your Taxes or Protecting Your Assets from the greedy, grabby hands of Big Brother, Grandpa is the go-to-guy. For over 50 long years he’s been more or less invisible to almost any kind of government official or questionable Big Brothers out there. PLUS he’s been paying ZERO taxes, legally for more than 50 years. Our editor-in-chief, who like all anonymous PTs, prefers to be known under his pen-name of “Grandpa,” has been living as an offshore international man for over fifty-five years. He’s a lively old raconteur and writer who believes passionately in freedom, privacy and the right of the individual to do exactly as he pleases with time and his own hard-earned money. Grandpa speaks several languages, has practiced tax and immigration law, and is a graduate of Wharton, the world’s top business school and also top law schools. He earned a doctorate which he calls “Ph.D.” – “a B.S. Piled Higher & Deeper” He’s a lawyer who doesn’t like lawyers very much. Gramps has a vast experience in coping with bureaucracy in more than twenty-two countries, including the USA, UK, and Switzerland. 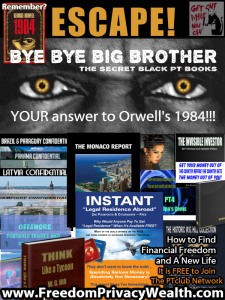 Since the original Bye Bye Big Brother reports (The Black Books) were published he has been acknowledged as the leading expert on second passports and citizenship’s, international private banking and alternative asset protection. All reports in the Bye Bye Big Brother series are written in Grandpa’s inimitable ‘parable style’ — packed with many real-life onshore and offshore case studies. To prevent the boredom that might come from a legal text, the material is not presented as boring lists or “rules” but rather as very interesting tales about real people. What is it? Mostly case studies – just like at Harvard! Why, though, does Grandpa remain anonymous? There’s a simple answer: He follows his own advice. Grandpa and the BBBB team have uncovered and frequently revealed stuff they can talk about only anonymously. In their home countries, they might be harassed, charged with conspiracy, or even face jail time. Freedom isn’t free and it is dangerous to be right when your government is wrong. 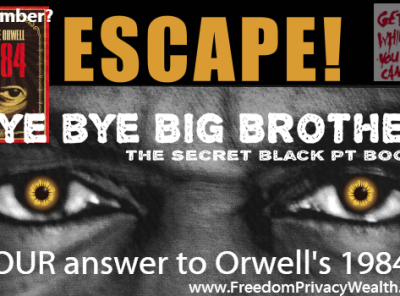 The Bye Bye Big Brother series also has lots of others: Contributors, co-authors and reader comments from people like you. Some are top offshore lawyers and private bankers. One is a retired diplomat, the author of Le Livre du Corps Diplomatique – a guide (published in English) available to BBBB Members explaining the world of diplomatic appointments and how you can become an honorary consul. If you knew their ‘real’ names, you might well have read about them. Some are “controversial” figures. 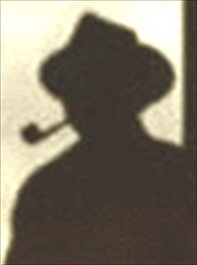 All authors contribute on the condition of anonymity. If you contact any of us personally by email and meet socially, on our (free) PT Refuge website, you may actually even get involved in international deals and get to know a few of us personally. 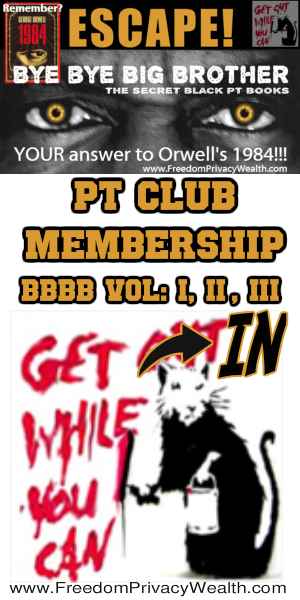 All book buyers get free membership in the PT Refuge. Grandpa follows in the tradition of predecessor PT writers he knew and worked with – including the legendary Dr W.G. Hill (Scope International), Harry Browne (How to Find Freedom in an Unfree World) and Harry Schultz of Monaco –the #1 Newsletter writer. Grandpa still offers personal consulting services but only to 2 per year and those who have read his most recent book, Bye Bye Big Brother. Although Grandpa is semi-retired in Monte Carlo, Monaco and enjoying the PT life, he will take on a very few new personal consulting clients this year. Grandpa is among other things, both a lawyer and a Wharton B-School grad with 60 years of PT experience. I prefer to stay behind the scenes as much as possible. I’ve never agreed to appear on TV. I won’t let anyone publish my picture. I am not willing to sacrifice my privacy for anything. That is why I am (and you should be) a Perpetual Traveler, invisible in plain sight yet seemingly always passing through. There are simple steps everyone could take to protect themselves. They are simply using one or more of the “Six Flags” I talk about in all my writings. If you have read this far, perhaps you will? No paper currency has ever survived longer than a few generations. Most have not survived even a few decades. Thus, to keep your money in money for more than the very short term is a terrible idea. Most people have NO IDEA what’s happening to the world around them. The vast majority ARE TOTALLY UNPREPARED for coming predictable and unpredictable changes. ¢ The prices of food, oil, and other commodities like silver, gold, cotton, copper, sugar, corn, aluminum, steel, and wheat skyrocket. ¢ Currency can lose up to 6% of its value in a day. ¢ Yet people keep money on deposit for 2 or 3% per YEAR. None of this is any surprise. When the Federal Reserve began printing trillions of dollars without any backing everyone with half a brain knew Americans would face a serious currency crisis and massive inflation. What steps can you take to protect yourself and your family? It is NOT (yet) too late. Why is Grandpa the go-to-guy? In June 1999, an underground society of 55 super-rich individuals was formed under the codename BBBB. BBBB stands for “ Bye Bye Big Brother. After nine years of silence, this secret group of super-wealthy individuals finally agreed to share their knowledge with the outside world. These elite group of multi-millionaires hired the best people money can buy “ international lawyers, consultants and financial whizzes to answer few questions. The result is a notorious ‘black book’ called Bye Bye Big Brother”. This secret group of super-wealthy individuals hired Grandpa to write the ‘black book’ called Bye Bye Big Brother”. Reason, why they hired Grandpa to write Bye Bye Big Brother, is in fact; not only has Grandpa written many other books and reports focusing on personal privacy protection and assets protection which can be found on this website, Grandpa has been living the sweet worry free Perpetual Traveler life one can only dream of and, for over 50 long years he’s been more or less invisible to almost any kind of government official PLUS, he’s been paying ZERO taxes, legally for more than 50 years. Doubtless, this slim volume will be imitated by the usual crowd of plagiarists. As they have never walked the walk, their advice will be mostly worthless. Unlike our imitators, your author Grandpa has been writing similar books and advising hundreds of clients for the last 5 decades. He has personally been through the wringer a few times & has emerged clean and dry and alive. Fifty years of helping consulting clients successfully work through their problems have taught us a few things. We will be passing on this information to you here… Every paid-up reader who bought this & who needs additional personal help can get a short, personal E-mail consultation from Grandpa. Just send Grandpa an e-mail with your questions. Brief Bio- He is a product of the world’s leading business and law schools. But Grandpa doesn’t care much for lawyers and accountants with or without fancy degrees. He feels that (aside from highly visible active business owners) his clients will do far better without them. Grandpa has been a PT for over forty years having retired young after making very serious fortunes in seven totally unrelated businesses. His books and personal services have been used by a goodly number of the world’s celebrities and High Net Worth Individuals. Grandpa accepts a maximum of 5 personal consulting clients per year. His current fee for two years of unlimited consulting is €15,000. A sample e-mail consultation is free for all BBBB book-buyers. A sample personal consultation otherwise is €1000 & deductible from the two-year fee. Clients can visit or contact Grandpa at any (reasonable) time; get to know him personally and tap into his expertise and contacts. Normally Grandpa can and will resolve all problems relating to residence, citizenship, litigation, domestic relations, and/or the Six Flags. Most importantly, Grandpa will introduce you to reliable sources & keep you out of trouble, far from parasites and fraudsters. 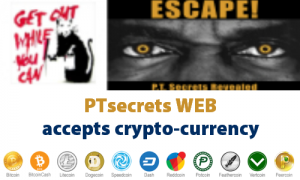 I am visiting this web site regularly, Grandpa shares very good info on privacy and all the free reports is really nice to get one going. I am actually discussing this info with some close friends. I was recommended this web site by my cousin as no one else know such details about my trouble. Grandpa, your stuff are amazing! Thanks!